Pigs are social and highly intelligent animals who make great pets, as long as you have the time and the space to keep them properly. As omnivores, they're able to eat pretty much anything -- anything edible, anyway -- so they can graze on grass if they want to. 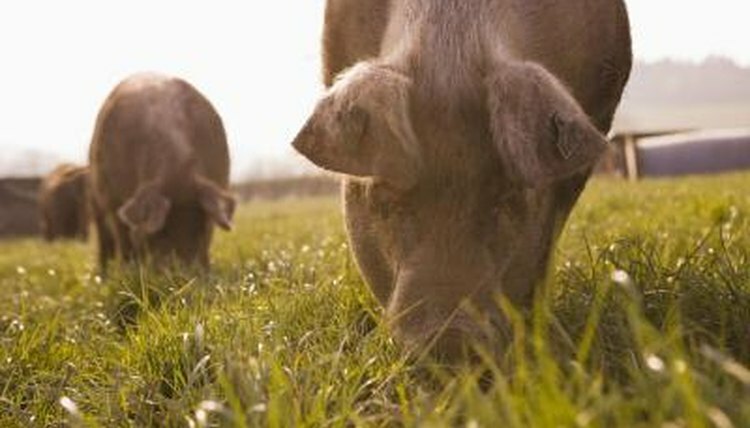 Although it's OK to keep your pet pigs in your home some of the time, they should spend much of the day in a large, grassy field. During this time, most pigs will readily graze. However, they're individuals, and some will prefer not to graze, either because there's other food available or maybe they're not particularly fond of grass. Although they can eat grass, most pigs can't live on grass alone. Kunekune pigs are the only true grazing species, who can survive just by eating grass in the spring and summer, when it's most rich. In addition to grazing, pigs will also often dig in the soil to forage for roots, grubs and other tasty morsels, and will even sometimes eat the soil itself, as it contains a range of nutrients. Such foraging behaviors provide stimulation and help keep these smart animals from getting bored. If you want to keep your land in perfect condition, pigs might not be your ideal pet. Pigs require a balanced diet, so they'll need additional feeding on top of whatever they forage for. A commercially made pet pig food is the best choice for most owners, as you don't have to worry about whether you're getting the right balance of nutrients. The amount you feed will depend on the age, size and breed of your pigs. However, you can supplement this with some more interesting, fresh foods, such as fruits, vegetables and grains. Pigs who are fed the wrong kinds of food can easily become overweight, which may have a negative impact on their health. Don't feed table scraps, as they're often too high in fat, salt and sugar for your pet to eat. Also avoid feeding any meat products, as they pose a potential health risk -- it's even illegal in some countries. Processed or "junk" foods, such as cookies, chips and candy, are other items that should be off the table, so to speak. Dale House Farm: What Do Kunes Eat?